May 4, 2010 - Following an hour long, highly charged Strike Authorization meeting, Machinists employed at the Boeing-St. Louis, MO Defense Systems plant authorized Strike Actions against the Company by a margin of 99% authorizing a strike if the final contract offer is not accepted on June 13, 2010. Several members stood up to express their outrage against several proposals currently on the table as the crowd applauded each time a call to authorize a strike was made. “Seniority, Pension, Healthcare and Job Protection seemed to be on everyone’s mind today,” declared Gordon King, President and Directing Business Representative for approximately 2,600 Boeing employees. When the Retention Language proposed by the Company was mentioned, the crowd erupted in protest. If left in the final offer, this erosion of seniority almost ensures a strike will be voted for in June. The current contract ensures that any layoff of personnel will be by seniority within each labor classification. The Machinist of 837 last struck the plant in 1996 when McDonnell Douglas still owned the facilities. Since Boeing’s last contract offer accepted by the membership in 2007, the membership has ensured the U. S. war-fighter has received the highest quality products ahead of schedule and with great savings to the taxpayers. Boeing’s Defense work in St. Louis has continually added to the company’s bottom line and workers expect fair treatment in this Contract. While this vote is a procedural issue used to notify International Headquarters that a strike may occur in the near future, today’s crowd was by far one of the most vocal in their display of displeasure. 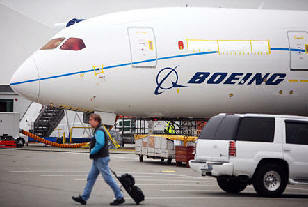 Monday's vote sends a strong message to the Boeing Company that the membership is united behind the Negotiating Team. The Negotiating Team, led by District President Gordon King, will begin main table meetings later this month, knowing that the people are willing to take whatever action is required to secure a good contract. The main table will focus on unresolved issues from the sub-committees and main economic issues. The current contract is set to expire on June13, 2010.